Which Colocation and Wholesale Data Center Operators in Chicago Are the Most Digitally-Savvy? The data center industry is growing and changing fast. And the Chicago metropolitan area is no exception. The Chicago-Naperville-Elgin, IL-IN-WI Metropolitan Statistical Area continues to rank as the third largest metropolitan area in the United States with an estimated 9.5 million population (2017). The Los Angeles-Long Beach-Anaheim, CA Metropolitan Statistical Area is the second largest (13.4 million 2017 estimated population), while the New York-Newark-Jersey City, NY-NJ-PA Metropolitan Statistical Area (20.3 million 2017 estimated population) is still the most populous region in the United States. While population density alone doesn’t forecast the health of a data center market, all three of these regions have multiple industries that are very data-intensive, iconic downtown facilities that have housed telecommunications infrastructure for decades, and lots of growth in suburban colocation and wholesale data center development throughout their metropolitan areas. 1547 Realty (fifteenfortyseven Critical Systems Realty) is developing a Tier III data center (Midway Technology Centre) in Chicago’s historic Schulze Baking Company building. AT&T still wants to sell off its data center business including facilities in the Chicago suburbs at 4513 Western Avenue in Lisle and 1000 Commerce Drive in Oak Brook. CyrusOne has, or will shortly have, a third data center building under construction in Aurora. Digital Realty has closed on the purchase of DuPont Fabros Technology. This brings its footprint in the Chicago metropolitan area to six facilities in Chicago, Elk Grove VIllage, and Franklin Park. Equinix has closed on the purchase of Verizon’s data center portfolio. Its facilities in the region now include 350 East Cermak Road, 5th Floor, 350 East Cermak Road, 6th Floor, and 350 East Cermak Road, 8th Floor in downtown Chicago, 1905 Lunt Avenue in Elk Grove Village, and 111 Plaza Drive in Westmont. INAP has acquired Chicago-based SingleHop to grow its footprint in managed hosting and infrastructure as a service (IaaS). RagingWire is building a data center in Itasca, near O'Hare International Airport. Stream Data Centers is building a data center at 2080 Lunt Avenue in Elk Grove Village. T5 Data Centers is expanding its Elk Grove Village data center that was purchased from Forsythe Technology in 2016. While digital transformation, mobile computing, hyperscale cloud computing, and business continuity have all been great drivers of growth for colocation and wholesale data center operators in the Chicago metropolitan area, many in leadership roles at these companies struggle with an inconsistency that leaves their teams at a severe competitive disadvantage. Why? People grew tired of interruptions and proved they were willing to pay to get what they wanted (no more, no less), exactly when they wanted it, 100% on their own terms. The empowerment rooted in search engines, social media, mobile devices, and cloud computing has fueled entirely new business models based on selective consumption of information. What many miss: all of these personal preferences that may start at home don’t just stay at home. These same influencers and decision makers, and all the other stakeholders that purchase data center-related products and services, bring these preferences into the workplace. Ironically, the data center, mission critical, cloud services, and telecommunications industries have benefited greatly from all of this growth in digital demand. Yet many of those in leadership roles at outsourced data center providers have failed to appreciate how these changes impact demand generation, desired customer experience, differentiation, competitive positioning, and their ability to stave off market disruption. The rules have changed for businesses of all sizes and shapes -- including colocation and wholesale data center providers in the Chicago metropolitan area. This change in the decision-making process presents enormous challenges to most data center operators in the Chicago metropolitan area that are stuck in the past, using the same business development, marketing, and sales playbook that they’ve used since the 1980s and 1990s. 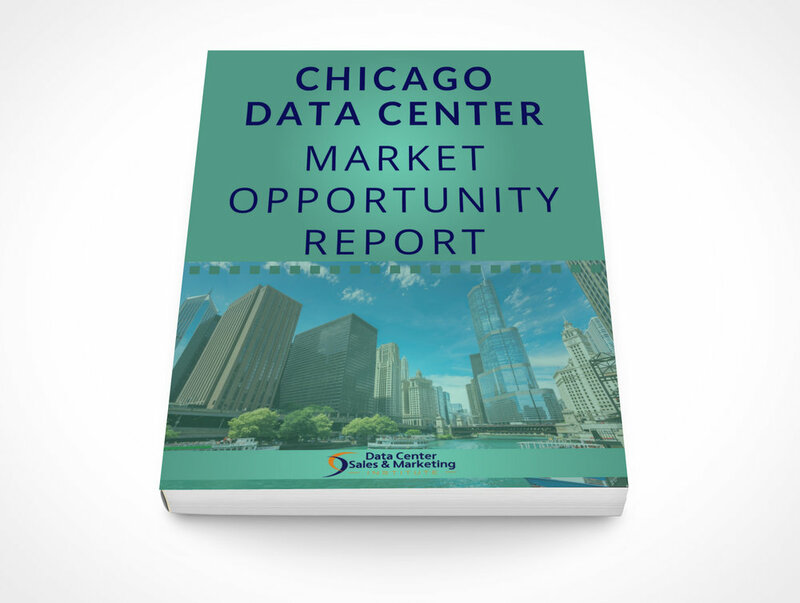 In the Chicago Data Center Market Opportunity Report, we’ll explore which colocation and wholesale data center operators in the Chicago metropolitan area are the most digitally-savvy -- and doing the best job keeping up. Have at least one multi-tenant data center location in the Chicago metropolitan area. 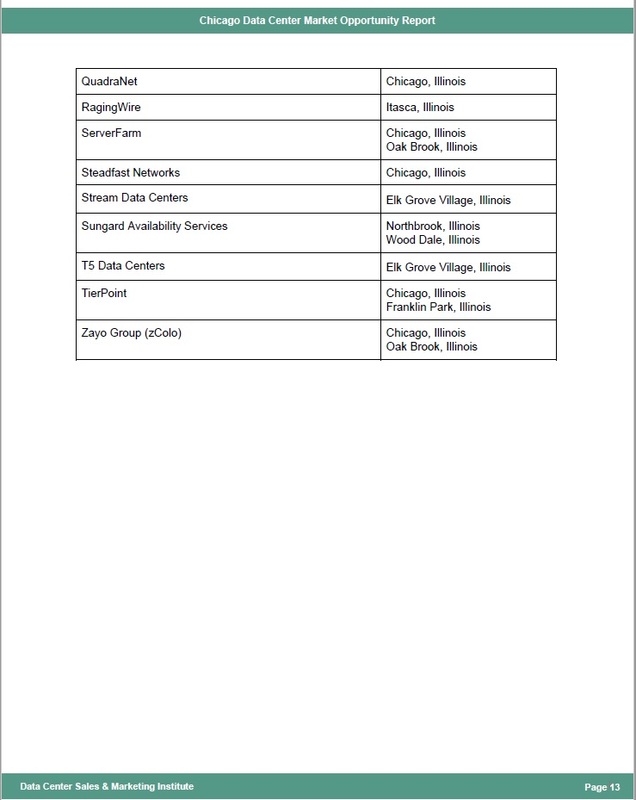 This includes downtown Chicago and western suburban areas from Northbrook to Westmont, and from Aurora to Rosemont (within a one hour’s drive of downtown Chicago, specifically 350 East Cermak Road, to directly compete with colocation and wholesale data center operators in the Chicago metropolitan area). 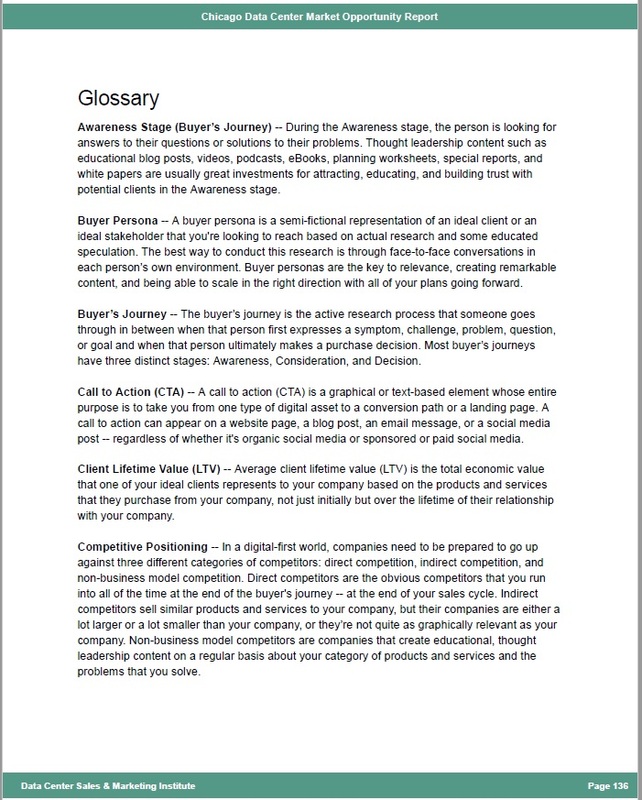 Use the words "data center" and/or "colocation" in their website Title Tag or above the fold on their website homepage. Have a functional website that displays their physical data center address(es) in the Chicago metropolitan area. Have a separate website page for each data center facility location in the Chicago metropolitan area. We ended up with 29 data center operators that have 57 physical data centers. We expect the number of data center operators to contract further, as more mergers are announced and completed in the coming months and years. However, we also expect the number of physical data center locations to expand. In other words, approximately two out of three outsourced colocation and wholesale data center facilities in the Chicago metropolitan area are either in downtown Chicago or Elk Grove Village, about 25 miles northwest of Chicago. 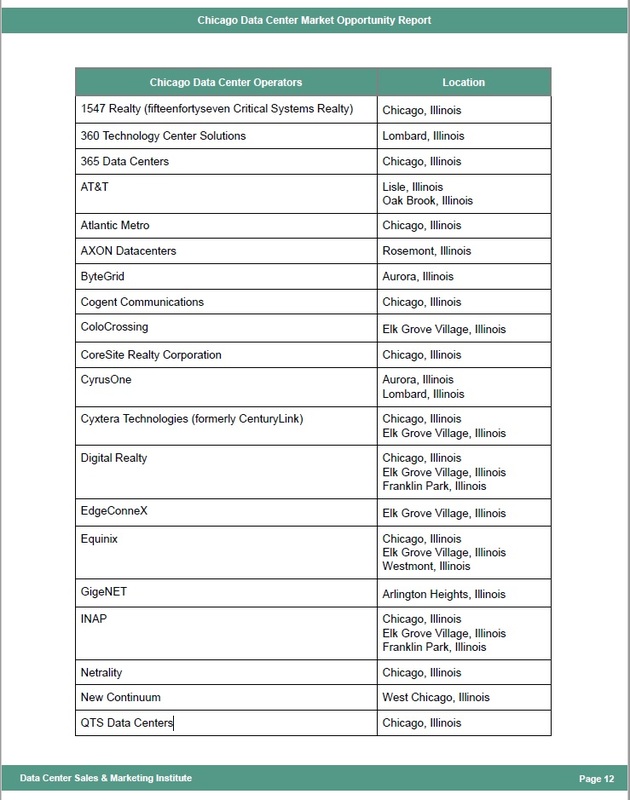 While we don’t believe that these 29 companies represent all of the outsourced data center operators in the Chicago metropolitan area that meet the criteria, we do believe that the companies included are representative of how digitally-savvy data center providers in the Chicago metropolitan area are. Just as a balance sheet is a snapshot in time, the data in this report was gathered during a one week period in April 2018. It’s fully expected that the outsourced data center operators within this report, and others that read this report, will make changes to their websites and broader digital presence. And just to be clear: While we do know stakeholders in various roles at 10 of the 29 data center operators included in this report, none of the data center operators in this report paid for inclusion/sponsorship.